What a thrill the small remnant must have felt as they heard the words of Haggai! More importantly, they recognized that the words were from God through His messenger. “From this day will I bless you” (Hag 2:19). Past failure did not have to control and color the future. If there was wholehearted devotion, God would bless. If the people of God made His house a priority (1:7-8), He would bless. If they gave their excuses a Sadducean burial and their flagging zeal a true resurrection, God would bless. Our God is still the same and continues to long to bless His people. As individuals we covet the blessing of God. As families, we increasingly need wisdom and mercy from His hand. As assemblies, we desperately need that touch from God to restore and revive. The gospel can once again flourish in our day. Entire sections of North America need workers. While we think globally, we must act locally. Your heart, home, and assembly is where blessing can be seen and measured. The challenge from Haggai is applicable to our generation and day: “Go up … and build … And I will take pleasure … And I will be glorified” (1:8). The motivation was not the promised blessing. God did not speak of that until later. The motivating factor was the pleasure of God. May the pleasure He finds in faithful service stir us. May His promise, “From this day I will bless you,” challenge us. May the new year serve as a fresh start in giving God the priority. 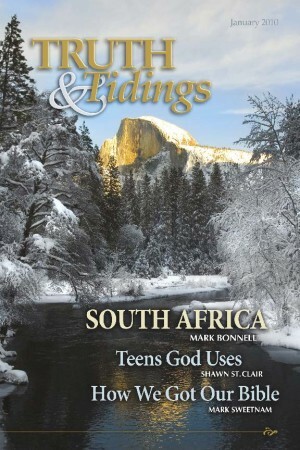 A magazine such as Truth and Tidings is the result of the sacrifice and devotion of many different believers, some whose names do not appear on the TOC page. Along with the staff ofTruth and Tidings, thanks is due to others: proofreading is done by Rita Dennison; graphics are supplied by Don Draper; the mailing, a difficult and vital job, is done by Paul and Tal Wielenga. Special thanks should be given to David Oliver for his excellent and painstaking answering of questions, to Gene Higgins for his efforts in organizing gospel articles and other labors, and to Norman Crawford who has been so instrumental in bringing the magazine to its current usefulness and continues to make the monthly trip to deliver the magazines to Canada. Paul and Linda Glenney manage the subscriptions and Phil Broadhead coordinates the “Tidings” section. There would not be a magazine without the sacrifice and labor of all of these believers. The new year will see series of articles on Amillennialism, How We Got Our Bible, The Offerings, Biographies, and Teens, as well as other features. New for 2010 will be a four page supplement for younger couples and young believers dealing with contemporary issues. This will appear quarterly as a separate entity. Overseers are encouraged to put these into the hands of younger men, women, and couples. We covet your prayers for the continued usefulness of the magazine.